Rosa Leon ’14, who graduated this past May with a dual major in biology and neuroscience, received a diversity supplement to Sandra and James Hewett’s National Institute of Health grant to support her research. This supplement will allow Leon to continue the studies she initiated as an undergraduate in the laboratory of James Hewett, professor of biology in the College of Arts and Sciences, now in collaboration with Sandra Hewett, Beverly Petterson Bishop Professor of Neuroscience and professor of biology. This is a mentored award, meaning that Leon will continue to work closely with both James and Sandra Hewett for the next 12 months, melding his work on epilepsy research with her work in neurodegeneration. Leon, who will soon begin applying to graduate school, can add this award to her already impressive resume. Recently, Leon was the only undergraduate among 12 people invited to present research at the New England Science Symposium held at Harvard University Medical School. She has also presented her work at the Annual Biomedical Research Conference for Minority Students (ABRCMS) twice. Both times her attendance was sponsored by the College of Arts and Sciences. Leon attributes her success largely to the mentors that she had during her undergraduate years in the College of Arts and Sciences. 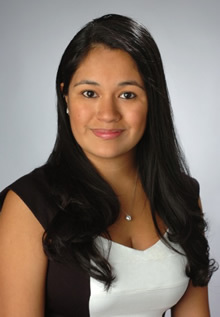 Originally from Lima, Peru, Leon moved to New Jersey when she was 8 years old. She also lived in Puerto Rico for several years before enrolling in Syracuse University. After completing her research at Syracuse University, Leon plans to attend graduate school. Her long-term goals include a Ph.D. in neuroscience and a career in academia, teaching and running a laboratory.